Although Madison was chosen as the state capital in 1836 and founded in the spring of 1837, it remained a small village for its first 20 years. In the spring election of 1839, only 54 people voted. A year later, the village contained only two stores, three public houses, three groceries, one steam mill for cutting lumber and a couple dozen houses — in all, 35 buildings surrounded by a thick forest. Wolves, bears, deer and game birds could all still be hunted on the capitol square, and during those years Dane County government effectively served the citizens' needs. At the end of 1845 a public meeting endorsed the idea of incorporating Madison as a village within Dane County, which the legislature approved on February 3, 1846. "On the 2d of February, 1856, the board of trustees of the village appointed a committee consisting of A. 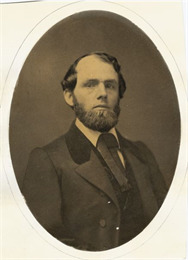 A. Bird, Simeon Mills, Dr. Thos. O. Edwards, and J. P. Atwood to draw up a city charter, and to procure its passage before the legislature then in session. The bill was drawn and Madison became a "city" by an act approved March 4. "On the 11th of March the first city election was held. Jairus C. Fairchild being an independent, and Julius P. Atwood the Democratic candidate for mayor; the former received 711 votes and the latter 506, electing Col. Fairchild by a majority of 205." Jairus Cassius Fairchild was born in New York in 1801 and moved to Ohio in 1822, where for a time his business partner was the abolitionist John Brown. He came to Wisconsin with his family in June 1846 and two years later was elected state treasurer. He was the father of Civil War general and Wisconsin governor Lucius Fairchild. Since the spring of 1856 Madison has been organized and governed as a city. Dozens of historical newspaper stories on Madison politics can be found on our website. 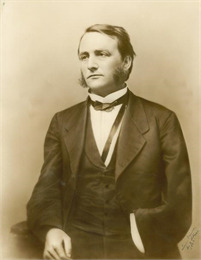 See more images, essays, newspapers and records about Lucius Fairchild.